Canon PowerShot S3 IS ultra zoom digital camara is an improved update to popular prosumer digital camera Canon PowerShot S2 IS. Canon PowerShot S3 IS features 12x optical zoom lens with USM and UD lens element, optical image stabilizer, 6.0 megapixel CCD, 2.0″ vari-angle LCD, 30fps VGA movies recording with stereo sound and Photo in Movie feature, DIGIC II, iSAPS and Flexizone AF/AE and 2.3 fps continuous shooting performance, live histogram during record mode, 20 shooting scene modes and MyColors photo effects, ISO range of 80 to 800 with no noise and widescreen (16:9) recording. More features and specifications at Canon PowerShot S3 IS official homepage (no longer available). LetsGoDigital reviews Canon PowerShot S3 IS ultra-zoom digital camera and concludes that all in all, it didn’t take much for the Canon PowerShot S3 IS to convince yours truly. You can get started quickly, and you will be able to capture all your moments with excellent quality in no-time. In fact, I wouldn’t be surprised to see the Canon PowerShot S3 IS rise instantly to worldwide bestseller fame. It is indeed a unique camera, suitable for everyone. Truly recommended to all that are looking for a high-quality versatile camera! Digital Camera Resource Page reviews and compares Canon PowerShot S3 IS with Canon PowerShot S2 IS and concludes that while not exactly an exciting upgrade over its predecessor, the Canon PowerShot S3 is still an excellent ultra zoom camera that earns my recommendation. It offers just about everything you want in a camera, from a big zoom lens to optical image stabilization to manual controls to a fancy movie mode. Digital Photography Review reviews and has a comparison between Canon PowerShot S3 IS with Canon PowerShot S2 IS, Panasonic Lumix DMC-FZ7 and Sony DSC-H2, and highly recommends the S3 IS. DPReview concludes that ultimately, like the models that came before it, the appeal of the S3 IS goes beyond simple pixel-peeping; it has a class-leading feature set, a very reliable image stabilization system (the benefits of which cannot be overstated) and superb handling. It’s well-priced, incredibly versatile and – above all – highly enjoyable to use. Despite the long lens and speedy operation it’s not the ideal ’sports’ camera (the focus at the long end of the zoom isn’t fast enough and does hunt a little), but for sheer shooting pleasure and versatility the PowerShot S3 IS still takes some beating. CNet gives Canon S3 IS a very good rating of 7.7 out of 10 and concludes that a cheap dSLR will provide better performance, and a moderately priced one will deliver better photo quality. But the Canon PowerShot S3 IS’s combination of features, performance, and relatively compact design certainly gives megazoomers a compelling alternative. Good points of camera are fast and responsive, comfortable design, decent movie capture, flip and twist LCD and fast, high-quality lens with effective optical image stabilization, while the bad points are tiny LCD, lacks raw support and faux wide-screen capture. Steve’s DigiCams writes that the PowerShot S3 IS is a very capable entrant in the megazoom digicam market. With 6-megapixels of resolution, a high-quality image-stabilized 36-432mm zoom lens, very good image quality and industry-leading support for moving images, the S3 IS offers a compelling combination of quality and versatility. It will please both the beginner and the advanced photographer with its consistently well-exposed and sharp results. The S3 IS presents a worthy alternative for consumer digicam users considering an upgrade to a consumer dSLR. While its image quality, responsiveness and viewfinder quality are not quite up to dSLR standards, the S3’s versatility, especially its movie mode and articulating LCD viewfinder, is unmatched by any dSLR available today. If you have a need for megazoom focal lengths, the S3 IS also represents a terrific value; while dSLR image-stabilized long focal length lenses sell for thousands of dollars, the S3 IS can be had for under $500, image-stabilized zoom lens included. Digital Camera Info (dead link) has a first impression review on Canon PowerShot S3 IS and concludes that this PowerShot has an optical image stabilization system that has been one of the main characteristics of the Canon ultra zoom line since its inception. This image stabilization mode works very well and keeps the bumps out of video and the blur out of still images. With the addition of the new ISO 800 setting, the camera adds an additional layer of blur protection, along with increasing the camera’s low light recording capabilities. The camera body has a 2-inch LCD on the back that folds outward and rotates. The screen solarizes, so it must be rotated frequently, but many people like the camcorder style. The Canon PowerShot S3 isn’t an incredible bargain, but does have more pros than cons and is priced right among its competitors at $499. Digital Photography Interface rates S3 IS 7.2 out of 10 in overall ratings and concludes that all-in-all, the Canon PowerShot S3 IS is a great ultra-zoom with very good image quality and some unique features. Well, the Canon S-series ultra-zoom cameras are usually known as hybrid cameras because of their superior movie mode. 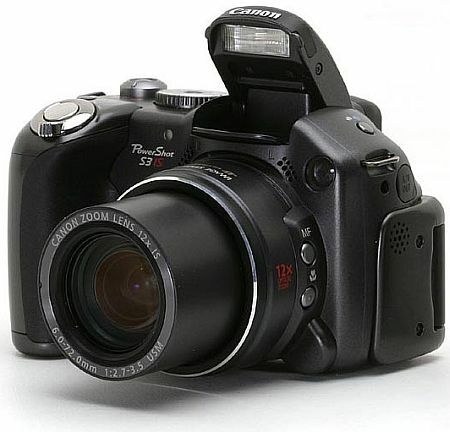 So, some improvements ought to be made so the S3 IS will really become a bridge between camcorders and digital cameras. If you can live with the small LCD and few tiny issues here and there, I’d recommend the S3 IS. Alternatively, there’s the Sony H5 if you’re willing to sacrifice the fancy movie mode and shutter speed (1/3200 sec vs 1/1000 sec) for a little more value for money and large LCD. Overall, it’s a tie between the Canon S3 IS and Sony H5. So you pick the features you need and naturally, the camera which fulfills your needs. CNet Asia (dead link) meanwhile writes that like its predecessor, the Canon PowerShot S3 IS is a formidable prosumer with a 12x optical zoom lens and impressive performance with editor’s rating of 7.6 out of 10. Good about camera are comfortable design, 12x optically stabilized zoom, reasonably fast camera, unlimited continuous shooting mode at 1.5fps, 0cm Super Macro mode and uses AA-sized batteries. Bad points are lens cap a hassle to deal with, small 2-inch LCD monitor, doesn’t support RAW formas and ISO 800 pictures unusable.